We are now able to give an example of two topological spaces $A$ and $X$ where $A$ is a retract of $X$ but such that $A$ is not a deformation retract of $X$. Define a function $r : X \to A$ as follows. Cut $X$ up into vertical circle sections. Then each circle intersects $A$ uniquely. 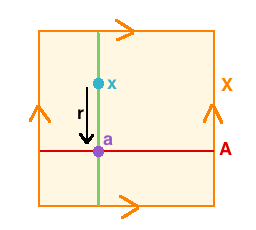 Define $r(x)$ to be the unique point $a \in A$ for which the unique circle intersects both $x$ and $a$. So $A$ is a retract of $X$. Showing that $A$ is NOT a deformation retract of $X$. These fundamental groups are not isomorphic and so $A$ cannot be a deformation retract of $X$.